Hello...Don't you miss the sunshine? I sure do. Fortunately for all of us...Springtime is just around the corner. 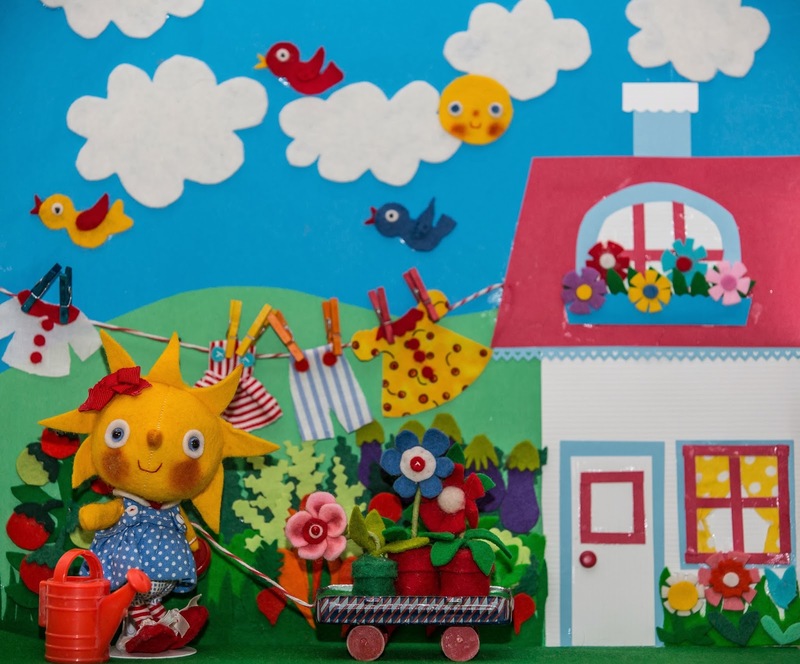 I have been busy making Easter and Springy pieces...as I am going to sunny California for a show. 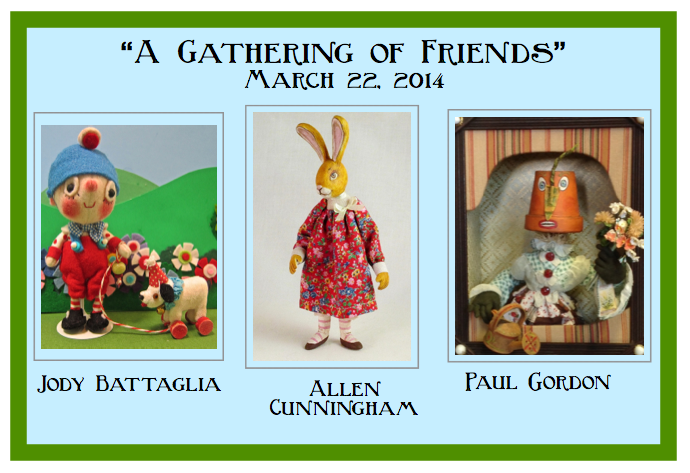 We, as in Allen Cunningham, Paul Gordon and I are going to Costa Mesa, CA on March 22, 2014 to have our fourth annual trunk show at the Ayres Hotel & Suites...325 Bristol Street...from 10:00-2:00. Why don't you join us? We will be having silly fun. I will post more photos of what will be offered in the near future. 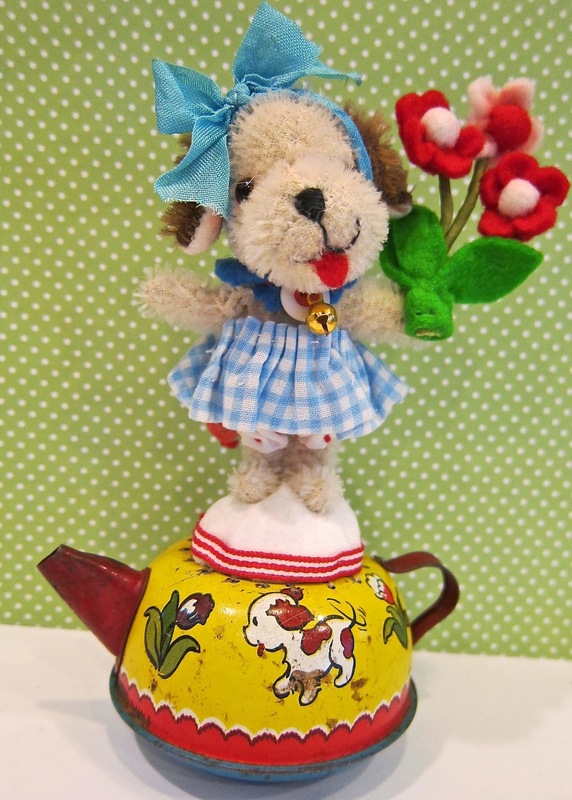 Even though it has been so gloomy weather-wise...Spring has sprung in my sewing room. These little bunny pin cushions are ready to march in the Easter Parade here in FunTown. Yes, we are dancing in the streets and also on teakettles because we saw some robins this morning. The bluebirds have come home to roost. Hooray! This little party gosling is ready to get on the airplane and have some fun with our friends in California...Maybe you should get on a jet plane and join the fun. It is time to pack our mittens away in a faraway place. Hello...My sincere apologies for abandoning my blog. I have many excuses in my pockets...but let's not get me started. I have spent so much time on my book...so I thought I would share a few peeks into the windows of FunTown. 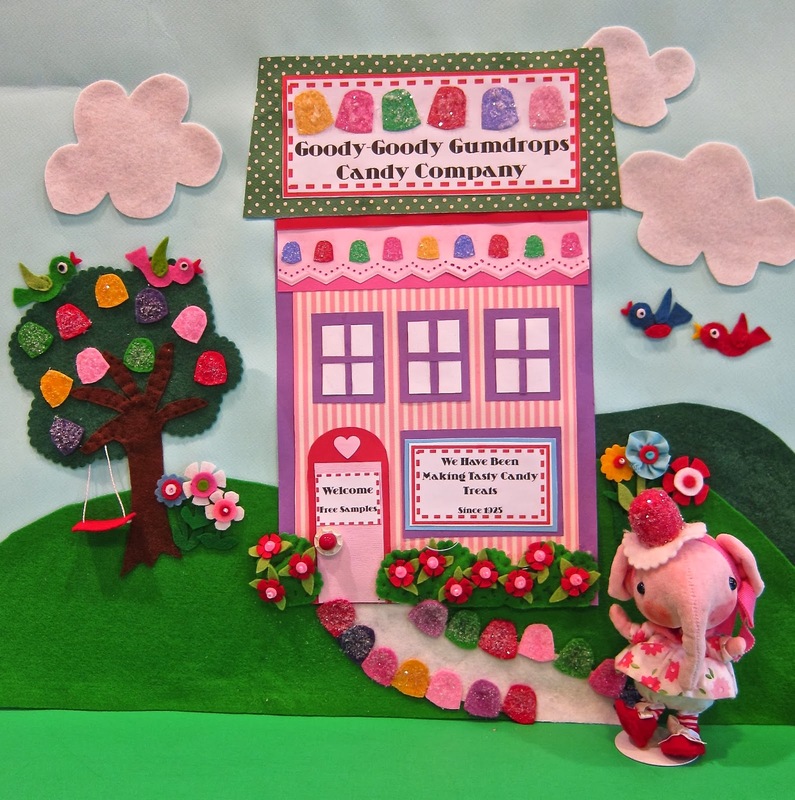 Let me introduce you to "Little Lucy Gumdrop," the great-great granddaughter of the late "Morris Gumdrop," the founder of the Goody-Goody Gumdrop Candy Company in FunTown. 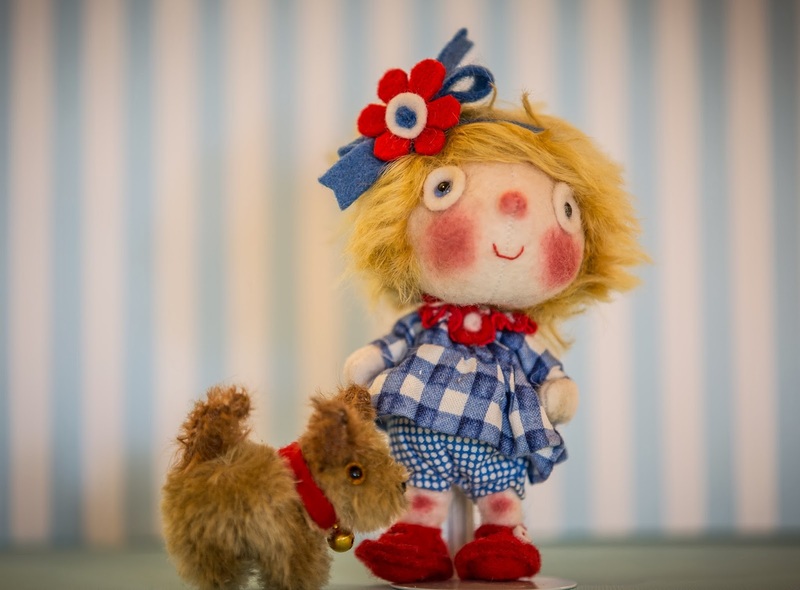 This is "Miss Ginny McFinny" and her little dog "Pip-Squeak." These two are the special tourists that visit FunTown. 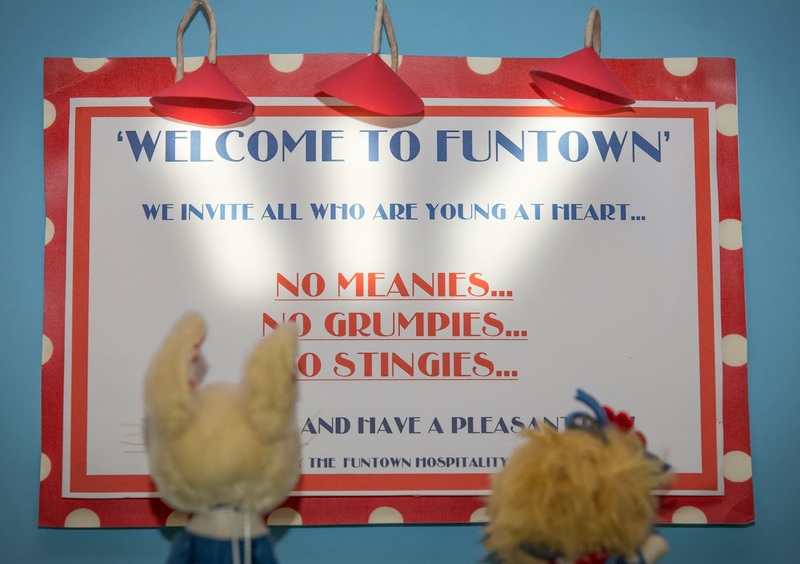 Upon entering Silly Street, the main thoroughfare in FunTown, Ginny and her tour guide Hoppy-Go-Lucky read this sign. It reads....NO MEANIES....NO GRUMPIES...NO STINGIES. I guess this is why FunTown is so much fun. This is SunShines Nellie, a little ray of sunshine. She has the most bountiful garden this side of Lake Johnny-Cake. 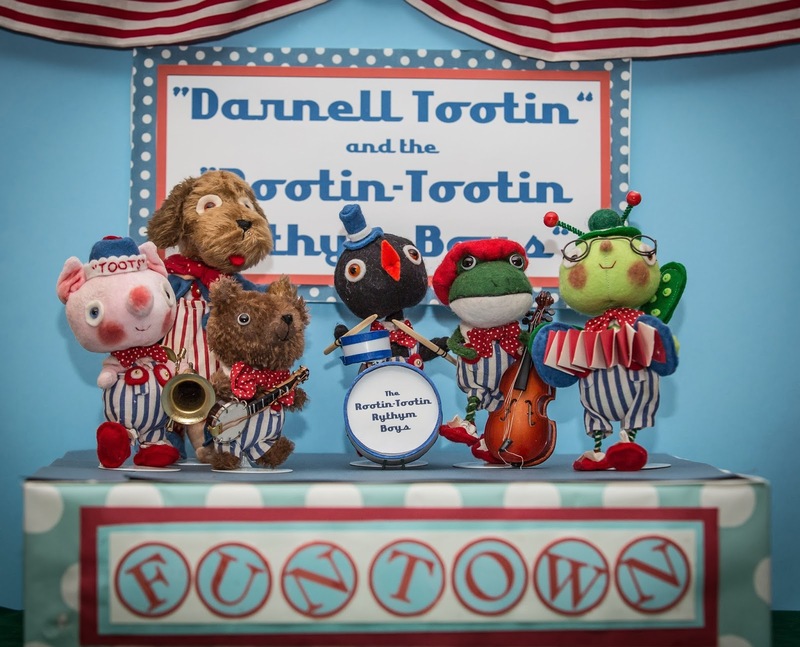 "Darnell Tootin" and the Rootin-Tootin Rhythm Boys, FunTown's famous swing band, The Funnies love to dance so these fellows are very popular. Should you decide to vacation there this year...here is a handy road map. In case you lose your way...don't worry as anyone in FunTown will guide you on your way. The weather is lovely all year long. I am so close to tying up the loose ends...so now you can see what I have been doing.